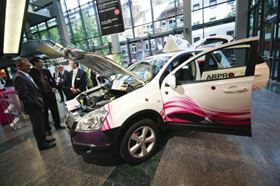 The VDI Conference: Plastics in Automobile Construction takes place in March 2012. "Plastics are essential construction materials for technical and economical innovations in automobile manufacture", says the conference director Prof. Dr. Rudolf C. Stauber of the Erlangen-Nuremberg University. "The conference provides an extensive overview of innovative plastics engineering solutions and lighting technologies in car and utility vehicle manufacture." Conference sessions will include presentations on carbon fibre reinforced plastic (CFRP) and composite construction for electric vehicles. Further information, the conference programme and registration form are available at www.kunststoffe-im-auto.de. The VDI Wissensforum based in Düsseldorf is a specialist training institution for the engineering industries. It organises nearly 1000 events annually. PM parts specialist GKN says that it will be leading discussion on drivetrain technology at the VDI Congress.